'Butterfly Wings' ( Clarence G. White, R. 1945) TMB. Midseason bloom. Color Class-B2D. ((( 'Theme' X 'Sacramento') X ( 'Incognito')) X (( 'Theme' X 'Sacramento) X ( 'Incognito'))) ; #14-E-42-8. Also listed in TB web: 'Butterfly Wings'. 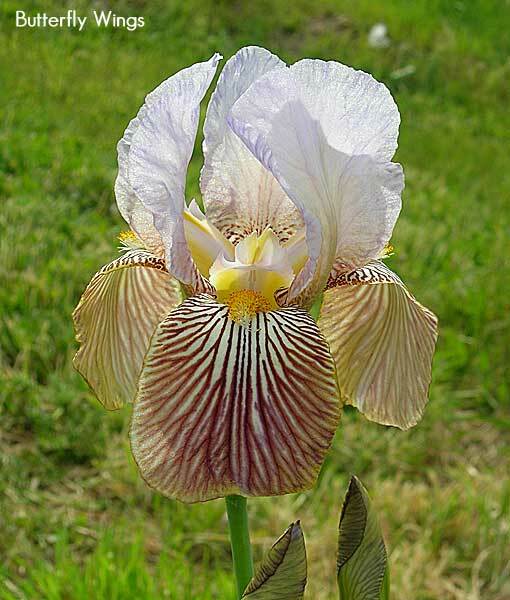 NOTE: This iris has not been accepted as an arilibred by the Aril Society International because it does not exhibit the aril characteristics necessary for ASI acceptance. The entry in the A.I.S. Checklist reads: Note the rather confusing parentage with large X everywhere! Theme (Lothrop, R., 1930) and Sacramento (Mohr-Mitchell, R., 1928) are TB. No information can be found on Incognito. One can assume it had some aril in it otherwise the Checklist entry would not indicate 'TMB'; (Tall Miscellaneous Bearded Section). The category 'arilbred' was not yet in use. However the Historical Iris Preservation Society's entry for Butterfly Wings reads '1946; TB-OG 36" M #B2D'; and gives a different parentage: ( 'Pink Jadu' x I. susiana ) X 'Theme' x 'Sacramento'). 'Pink Jadu' (Sturtevant, R., 1931) is a TB pink plicata. The HIPS-Roots web site also gives the following description from Lloyd Austin's Rainbow Gardens 1952 catalog. "Yes, an Oncobred as beautiful and as captivating as wings of a tropical butterfly, veinings that come from its grandparent, Susiana. So, I picture for you a whole cluster of 'Butterfly Wings', like a swarm of freshly alighted butterflies. Above, the coloring is translucent lilac blue - below, it is rich parchment, veined in golden russet and deep carmine. Thus, these iris have the exotic charm of true Oncos, but unlike them, are borne on yard-high, well-branched stalks. A real accomplishment for 'Clarence White', but this need not be the trails end. This rare hybrid is fertile and I have a wide array of promising new seedlings just coming into bloom from 'Butterfly Wings' X 'Rocket', 'Chivalry' and other favorites of mine. Now you try it!" Further points to add to Austin's description is the narrow russet hairline edge not only around the falls but also around the standards. The leaves are lightly colored rosy red toward their base; the bud sheaves are also lightly pigmented. 'Butterfly Wings' is a strong grower and very pod fertile, each year practically all flowers are bee pollinated in my garden. From The Court Of Iris catalog, 1955: BUTTERFLY WINGS (White '46) M 36" (Pink Tadu X Susiana) X (Theme X Sacremento). While the seed parent is but half Onco, it has passed to its offspring a charming array of exotic characteristics. The many blooms are borne on tall, well branched stalks. It sets seed easily although we have never had it cross with another Onco-bred. The standards are of light lilac-blue and the parchment colored falls are heavily patterned in mulberry, crimson and russet-brown. A startling flower, which is one of our favorites. $2.00 H.M. '47. From Supplement To The Comprehensive Checklist of Aril and Arilbred Iris by Sharon McAllister, April 2000: BUTTERFLY WINGS AB (Clarence G. White, NR). Sdlg # NIA. (Pink Jadu x I susiana) X (Theme x Sacramento). Tell: "Porcelain blue (or blue oyster shell) with falls heavily lined like a butterfly's wings." Rainbow: "Above, translucent lilac blue - below, rich parchment veined mulberry, crimson and russet." Vallette: "S. pale wisteria blue; parchment F. veined rust and carmine ... its stripes are quite dominant." White, 1946. Notes: No record of introduction was found for the TB coded B2D (blue ground with blue feathering) and registered by White as "Butterfly Wings" in 1945, this is the one listed in catalogs from the 1950's as a 1946 White introduction; an OB- in both systems. Ref: Rainbow Garden's & Tell's Catalogs; ASI '78 YB, p.64; Vallette, p. 175.